If you are in the hectic throes of planning your wedding, the chances are that you are excited, terrified, nervous, and ecstatic. This intense mix of emotions can lead to you feeling overwhelmed and stressed with a mammoth to-do list. Try not to worry. Every bride has to go through this panic stage before things begin to settle. The most pressing issue with regards to your big day is the theme or style that you are going to choose. Most couples choose a color scheme but that tends to be it. Only the more daring go for a full on theme. Doing this can be exciting, highly personalized and can make your wedding day unforgettable. Take a look at these themes to inspire your big day. If you and your partner adore nothing more than sitting down to watch a good film, your first date was at the cinema, or you are planning on going to Universal Studios for your honeymoon, a movie themed wedding might be just up your street. Plenty of arthouse style cinemas now act as amazing venues for weddings. With a screen as a backdrop, a readymade aisle and seating for guests, and a stage, this can be the perfect atmospheric venue for you. The screen can be used to display some of your most happy and embarrassing couple pics, you have surround sound ready to play the song for you to walk down the aisle and all of your guests will have an excellent view. You can add to the theme with popcorn snacks, a nachos and hotdog buffet, and some classic ice cream for afters. 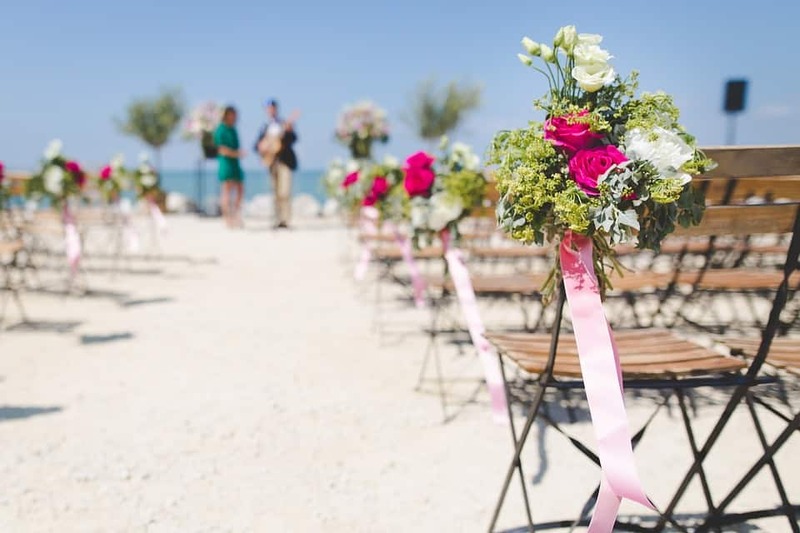 Beach weddings have always been the classy choice when it comes to a theme. Since the emergence of destination weddings in the late 1990s, people have dreamt of saying their vows with waves lapping at their feet, the sun beating down and guests enjoying the ocean view. The photographs will look outstanding and you will have a perfect outdoor wedding. You could go one step further and encourage a colorful dress code, be a tad less formal than other big days, and enjoy some Hawaiian shaved ice refreshments alongside lemonade and a beach barbecue. A beach party can follow allowing you and your guests to celebrate into the early hours. For those who really want to make a name for themselves at their wedding, it might pay to look into something more unusual and record breaking. Couples have been getting married in uncharted territories for years. One couple recently got hitched at an Arctic research station. Another said their vows underwater while scuba diving. While it may take some thought, you too could choose to commit to your partner somewhere unusual. How does the peak of a mountain, the middle of a desert or straddling a fault line sound? Getting married should be one of the most special moments of your life. Consider what would make your day perfect and go all out to try and emulate this in your chosen theme.